This is a beautiful and free snow play area with great slopes. If there is natural snow, this is the best place to get your small children to play in the snow and ride a sled when you are visiting Mammoth Lakes. This is a large area with several slopes available for sledding. In addition, there is plenty of room to build a snowman or start a snowball fight. We went to this area with a larger group and our kids simply loved this place. The entire group had around 10 kids and they all had great fun. 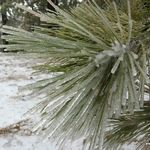 If you are planning a trip to this area you can look for budget hotels in the June Lake area, or find great prices for hotels in the Mammoth Lakes area. This snow tubing area is a commercial snow tubing area that is well groomed and well organized. It is pricey however at $20 per adult and $15 per child and there is no official place to build a snowman or simply play in the snow. The ticket is valid for 3 hours but we found that it was more than enough to have fun snow tubing. It does get repetitive after a while and we took the kids to an unofficial snow play area on the side of the ski slopes. That seemed as much fun as the beautifully groomed snow tubing area. 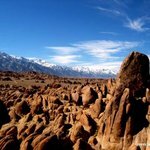 If you are planning a trip to the Mount Shasta area you can find budget hotels in the area. 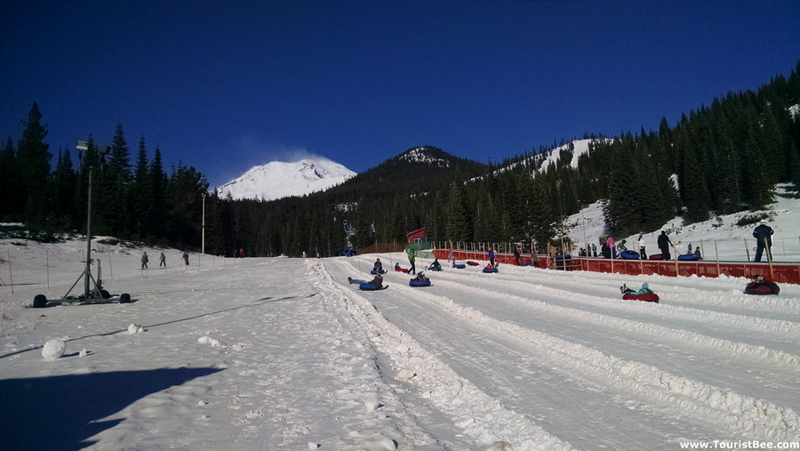 The snow tubing area at Mount Shasta Ski Park is safe and professionally maintained and groomed. It is pricey however and it’s a shame you can’t just play in the snow there, you can’t even throw a snowball. Near the resort entrance however, on the very left of the mountain, there is a large snow play area that is not maintained but it is a lot of fun for children to play in the snow. This area only works if there is natural snow. 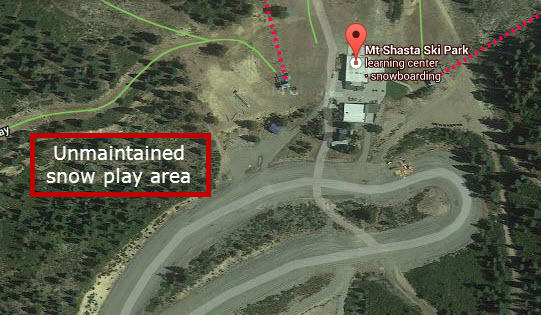 When you drive to Mount Shasta Ski Park you will have to turn left from Highway 89. Exactly at that point on your right there is a beautiful sledding area that looked perfect for little children. There was not enough snow however and the slope looked muddy. So we were forced to drive to the ski park where we knew that the snow tubing area was up and running and our kids would not be disappointed. 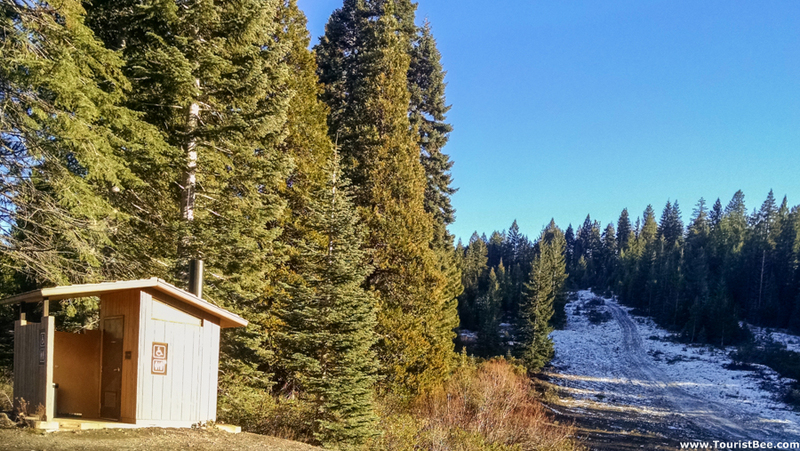 McCloud, California – Snow play area at Snowmans Hill Summit right off the 89 highway heading to Mount Shasta Ski Park. 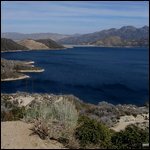 This is a great area for snow play and sledding, but it depends only on natural snow. So it may be hit or miss, depending on the conditions. If you are planning a trip to the Mount Shasta area you can find budget hotels in the area. 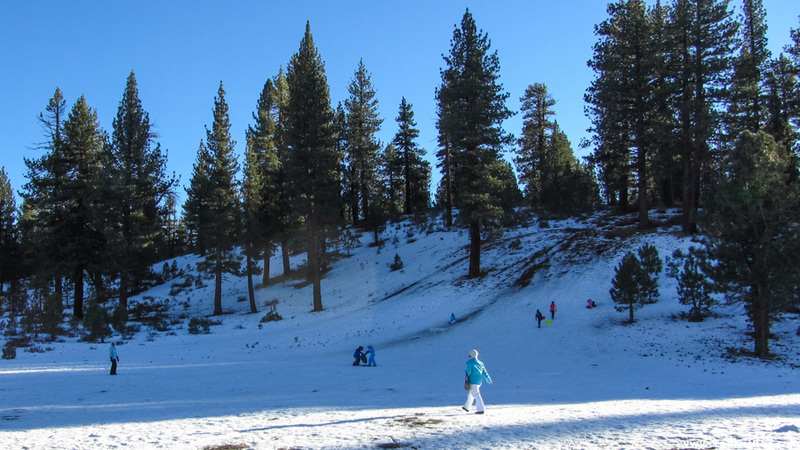 This snow play area is at much higher elevation, so you have a lot more chances at finding snow. However you need to check road conditions before heading up there, since the road may close when there is a lot of snow. P.S. 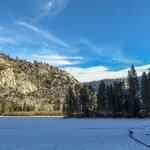 Please let me know if you know of any other commercial or non-commercial snow play areas for small children in Northern California. Thank you Paul…I didn’t know about Eskimo Summit. Eskimo Summit is a great place to play, tube, and sled. It is a non-commercial area, on the way to Lassen Park, with restrooms. You can even light a fire.